The Revival Suite's elliptical forms and rolled edges create a look that is classically romantic. This bath handle trim features ergonomic scroll lever handles with a lustrous finish. Pair this trim with high-flow ceramic disc valves for optimal performance. Adding a coordinating bath spout provides a convenient and stylish look for your bath. The Voss High-Arc Roman Tub Faucet Trim Kit from MOEN produces the transitional look you've envisioned for your bath area. Minimalist design produces an understated elegance in this two-handle deck-mount fixture, which features crisply honed edges and a gleaming chrome finish to make a chic style statement. The gracefully curved spout rises 8-1/2 high and extends 8-1/4 over your bathtub, dispensing up to 13 GPM with a compatible MOEN valve for quick fill-ups. Part of the M-PACT common valve system, this set makes it simple to substitute the trim without tweaking the plumbing should your future style preference change. 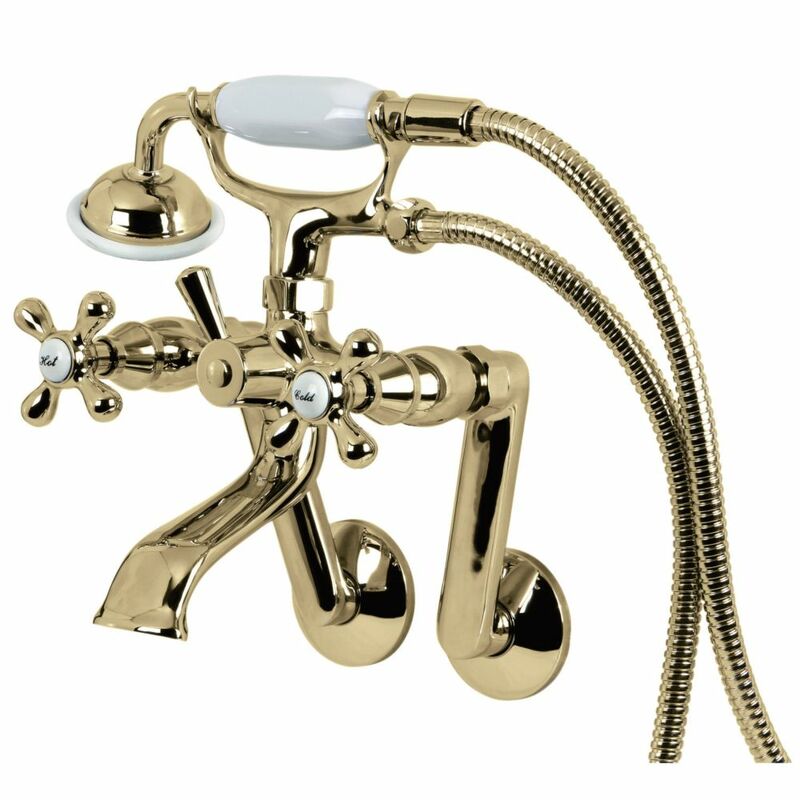 Victorian 3-Handle Tub Wall Claw Foot Tub Faucet with Handshower in Polished Brass Bring a modern style with a nostalgic feel to your claw foot tub. Featuring an elegant wide spout, this faucet will look great in any bathtub. Solid brass construction for durability and reliability and a hand held shower. Victorian 3-Handle Tub Wall Claw Foot Tub Faucet with Handshower in Polished Brass is rated 5.0 out of 5 by 1. Rated 5 out of 5 by Ken from The faucet works great.. The installation was a problem. The faucet works great.. The installation was a problem.